Fee​: 15 euros* for the whole workshop. In this workshop, we will explore the physical, psychical and sensorial implications of the action of “falling in”. Inspired by the Deleuzian concept of “becoming” (coming from the Latin verb “devenire” which means “coming down, falling in, arriving to”) Marta Wörner proposes the inquire of the fall as a physical door to the unknown. Understanding “falling in” as an uncontrolled abandoning the body to the force of gravity and embracing its implication on the mental state of the performer, we will focus in the re-organization of the body in between moments of physical balance. It is a play between controlling and “falling in” in which the participants will inquire the potential of their articulated movement, the openness of the body worked through the relaxation and conscious use of the core, and the awareness of the space. The kinetics of the human body and its ability to reorganize itself to become another thrives me. As a maker, Marta is interested in exploring its interaction with other structures that do not change or move that way, as the established structures in the city or fundamental building blocks of our thoughts and beliefs. 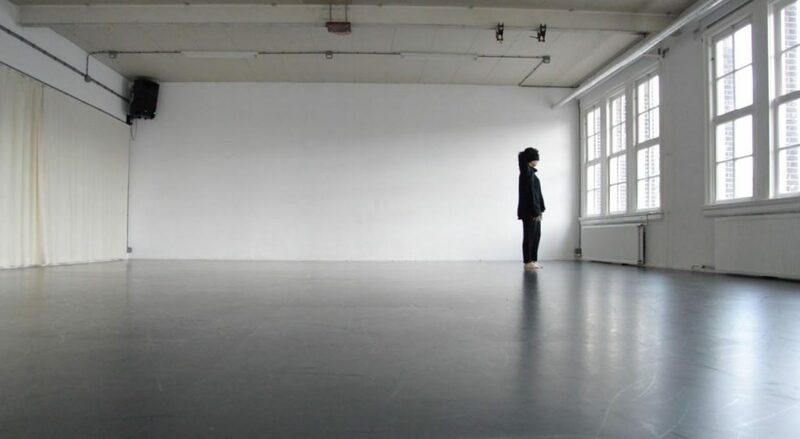 The workshop also has the aim to invite a selection of participants to the following artistic residency of Marta Wörner at CLOUD DansLab, in which she will continue developing her artistic research. Defining the body as a natural structure, she always wanted to learn from it. With the firm thought that the body has an inherent valuable knowledge that I can not name yet, but intuit it, I always moved. Her other fascination is the deconstruction of the space through the scenographic tools and the dramaturgical possibilities of it. The goal with this research is to build a space between the theatre and the street through the deconstruction of space and scenographic dramaturgy as tools, which allowed me to explore the dichotomy solid-fluent/structure-destructure and its application and affections to the body, all below the inspirational umbrella of the idea of performing the concept of “becoming” and reflecting on it. RESEARCH QUESTION FOR THE ARTISTIC RESIDENCY AT DANSLAB. The artistic residency at CLOUD DansLab will start with the workshop FALLING between 26 Feb- 10 March , the reserach stage of the residency will be carried out between the 13th and 26th of May. 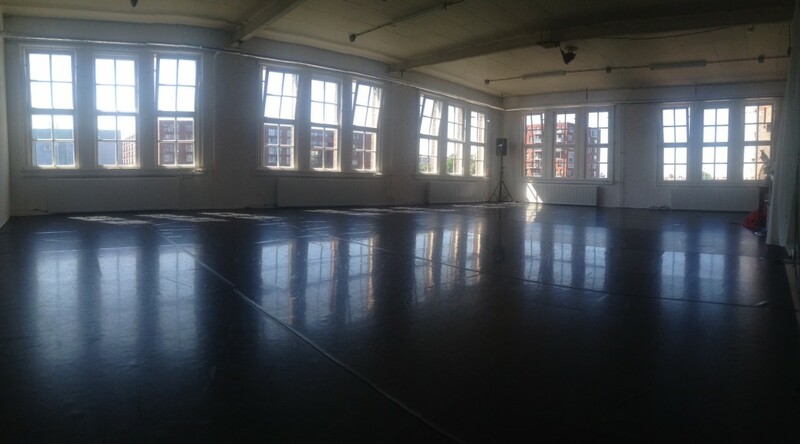 In this two weeks residency at CLOUD DansLab, Marta wants to explore the implications of transferring my findings on the embodiment of the Deleuzian concept of becoming as a tool for material creation to other dancers/performers..
lo bil is a York University Interdisciplinary Masters student creating body-based performance art using cross-disciplinary methodologies to correlate research into process, pleasure, vulnerability, an aesthetics of feeling, and the impacts of a social location on identity. Through non-repeated performance gestures, lo generates intuitive research into academic concepts by using physical improvisation, spontaneous utterance, impulse- based scores, object manipulation, and inter relational proposals with audience. Her work has been called “raw”, “amusing”, “transparent”, and often involves creating a feedback loop with the audience. I am developing a performance-research practice of “dropping” questions into the body, aiming for “non-repeatability” and moving on intuition as a method for understanding philosophical texts. 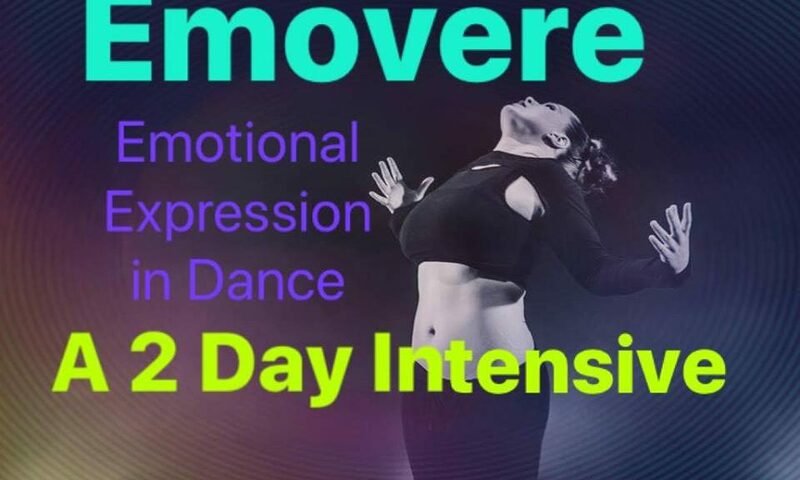 Encouraging myself to move into states of intoxication through movement provides an entry-point into my unconscious image life, connecting abstract physical impulses to sublimated content by letting speech effect movements and movements affect speech. Making this physical practice into a performative one, layers on an interrelational complication, to notice how the body responds to itself while being seen by others – in this state of hyper-awareness and “felt knowing” – thoughts surface differently. I become aware of “habits” or psycho-physical patterns of movement and related thought sequences from memory. I try to identify, deconstruct and reorder these habitual patterns into non-repeatable forms, disrupting psychic material that surfaces. I want to interrogate habits that are blocking my ability to create new ways of thinking. I will prepare with texts by Butler, Nancy, Deleuze and Guttari, Ranciere and Agamben. I am a Performance Artist. I write with images – sourcing my work from my own identity transparently and investigating my philosophical problems with improvisatory actions and object relationships. I offer audience situations and provocations to dream around. I offer a context for people to think of their own questions and notice their own desires. I practice for months, but in the moment before the performance, I let go of what I want to happen or expect to do. I ask, “How can I be in front of this audience in an attentive and receptive way and what is moving to me about the topic at hand right now?” I do this action. This first mark on the canvas is an offer that I follow through to the end of the composition. I use body memory as a generative source of possible exchange and inquiry. In this way, I am researching my knowledge and lack of knowledge; I am accepting the reality of my body, the reality of my economic state, the reality of my class, my gender and all unknown aspects of my history. This performance style is a DIY strategy where in body and thought I am ready to perform at any moment in alignment with my own integrity and the nature and energy of the people present. The “currency” of this methodology is the responsiveness to context – information can be immediately incorporated into the texture, movement, and conversation with the audience – thus the work allows us to unpack questions in a collective way. 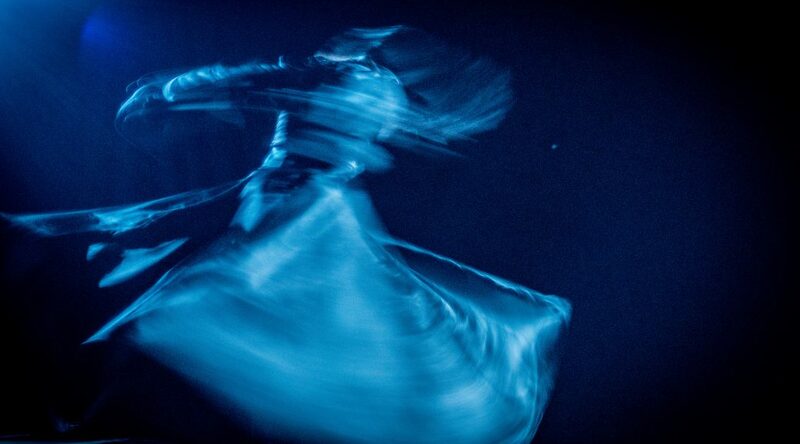 I am also researching what it is that elevates my consciousness in the moment of performance – that energetic flow that allows meaning to emerge that I could not have realized if I had not made the performance. This question has come from my constant radical doubt around: why perform at all? I keep performing because actually it is in the moment of performance that I don’t know where I’m going, that I can look back at and say: I know where I am going now, thanks to this performance. As crazy or wild as the performative state can be, it leads me into knowledge. I would love to have conversations with local artists to help generate more context for the performance proposals and for my thesis writing. And perhaps by relying on our sensorial capacity and perceptual ability we can fertilise the grounds of these new realms through artistic experiences, so that we may reclaim the gaze of our whole being. How does a darkened safe space influence the way we perceive ourselves, our environment and one another? Over the course of one week, CLOUD/Danslab will become a completely darkened environment. During this period, I will gently guide you through daily sessions that work toward our sense of presence, sensorial awareness and felt connection. We will move delicately in the dark through a sequence of simple movements. 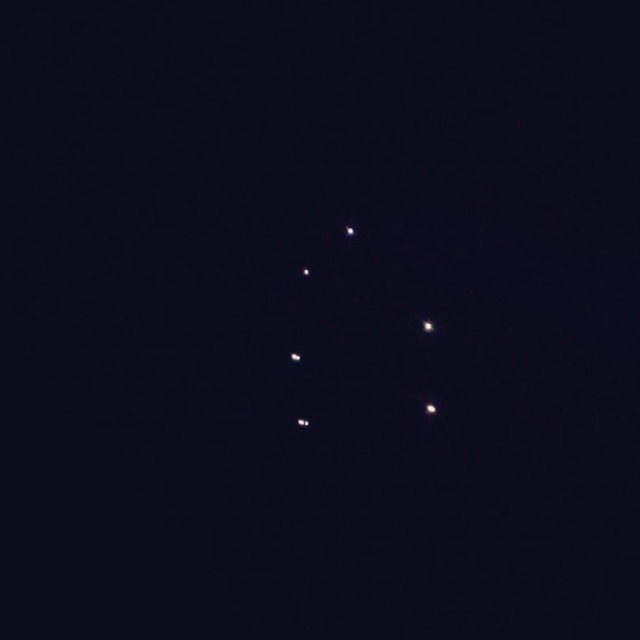 Each person is equipped with two light dots* for visual reference. *(Light-dot: a 6mm magnetised dot that clips on clothing. In darkness it glows white. The glow dims naturally over time). – When our senses of proprioception, hearing and vision are fully activated in a darkened space, how is our perception of self and of the other influenced? – How emergent movement is experienced meaningfully in an unconventional environment. – How verbal variations of the same instructions influence audience participation. – How can we effectively compose such experience? (one that is repeatable, has a clear beginning, entry, exit and quality). – To be an active part of the creative collective process, aimed at finalising a time-based perceptual composition that lends itself to a broader audience as a participatory experience. We will brainstorm together, go through iterations of movement and sensorial exercises to improve concentration and a sense of togetherness. Your input and feedback as a creative being will shape the week’s progress. – A warm and friendly environment, with tea, coffee and snacks. In this, a chance to experience this same environment in an expanded and evocative way. based on your availability, open from Monday 7th to Sunday 13th of May. Times to be decided. Situation Body: Participants wear a light-dot on the chest (above clothing) and on the back. The room is completely dark. Begin by standing upright and still. arrive in unison with the others to a comfortable walking pace. Presentation | Residency of Alegia P.
I am an emerging media scenographer and visual artist. I am based in The Hague (Netherlands) but working between The Netherlands, London, Athens as well as other cities in Europe. My background is in Design (BA Interior design / Vakalo College of Arts & Design Athens, University of Derby UK) and I hold a master’s degree (MA Scenography from the Royal Central School of Speech and Drama, University of London). Currently I am undertaking my second master’s degree MA ArtScience in The Artscience Interfaculty (Royal Academy of Arts – Royal Conservatory – The Hague NL). I work mainly in set and costume design for performance, theatre and installations. My work involves video, photography, lighting, projection mapping, sound editing, electronics hacking, scenic art, sculpture and any other technical support suiting the project. In March 2018, I had a two weeks residency in The Cloud DansLab, in The Hague. During this residency, I started working with the idea of perception, body, movement and vision. Key words: perceiving, touch, smell, see, feel, movement, formless. People perceive differently the world around them due to many factors such as nationality, age, gender etc. According to Freud, the infant starts to perceive the world through his/ hers body. Perception allows behaviour to be generally appropriate to non-sensed object characteristics. For example, we respond to certain objects as though they are doors even though we can only see a long narrow rectangle as the door is ajar. I am using the vision (present or absent) to change (the condition) of people’s perspectives. I whilst to question the visible via sensations (hear, touch, smell, movement). And to “force” someone to experience simple very basic actions such as walking (with the eyes shut) by feeling not thinking. Someone needs to lose control in order to perceive differently. The workshop is a moment of sharing within the residency of Emilie Gallier and Teoma Naccaroto. Two rivers spill into each other. Each body of water has a unique rhythm, temperature, and composition, so the process of mixing is gradual and dynamic. Confluence involves collision, resistance, and mediation – in context. We explore confluences across analog and digital materialities, through tactile gazing and listening between partners, and with objects. 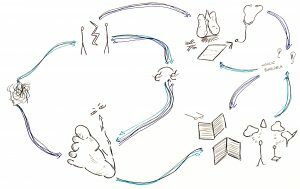 Using stethoscopes and transducers, we play with how sounds from the body and environment can be (re)materialized and (re)distributed as haptic feedback in the surfaces of paper and skin. We share practices that involve breathing and sensorial exercises as a way to tune the act of reading into a tactile activity. As we listen and read, the channels of confluence multiply and overflow, leading us to examine moments of dissonance and interruption within collective practice and creation. The workshop is a moment of sharing within the residency of Teoma Naccaroto and John MacCallum. Read more here. This workshop explores listening techniques between performers, in scenarios mediated by biosensors and biofeedback. Together, we will investigate a seemingly simple task: listening to and relating with a click-track. At times the click track will be generated by computer software, while in other moments the pulse will be derived in real-time from an electrocardiogram, worn by a dancer. As performers your challenge is not to follow, nor to anticipate the pulse. Instead, we ask that you attend to your unstable temporal relationship with the click track, such that you have agency to assemble and adapt the rhythmic textures that emerge between your actions and the media. This training process is highly structured and repetitive, and involves breathing, shifting weight, and eventually performing choreographic and musical scores in relation with the variable click track. SPIRAAL is an original, contemporary approach to whirling movements. This approach was developed by Valentina Lacmanović, based on art, science research and practice. Spiraling movement is at the core of our galaxy, our DNA, it is the force of nature in hurricanes and vortices. Spiraling patterns can be found in the shape of our fingerprint and the form of Time. It is a powerful instrument that leads towards harmonizing our physical, mental, emotional and energy bodies. 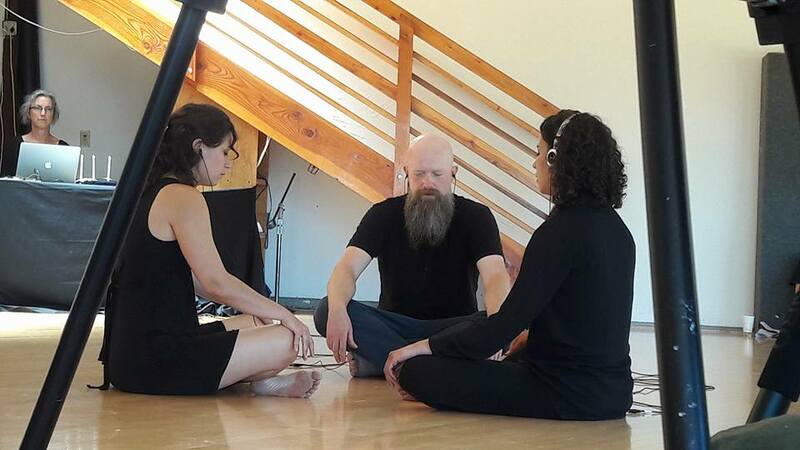 SPIRAAL workshop proposes an intensive work on sustained spiraling movement technique, disorientation, listening and body/mind (dis)connection. In a safe environment, participants travel through trance-like states and learn how to tap into the creative flow. The build-up is inspired by techniques of breathing, internal martial arts and organic approach to body and mind motion. An introduction to ritualistic elements in contemporary performance is given through structured improvisations. *Suitable for anyone engaged in corporal practice (dancers, performers, actors, martial arts or yoga practitioners… both amateurs and professionals). OPEN LEVEL! Action dance workshop with Sandra Kramerova is geared towards exploration of technicality, dynamic modalities and aesthetics of athleticism. 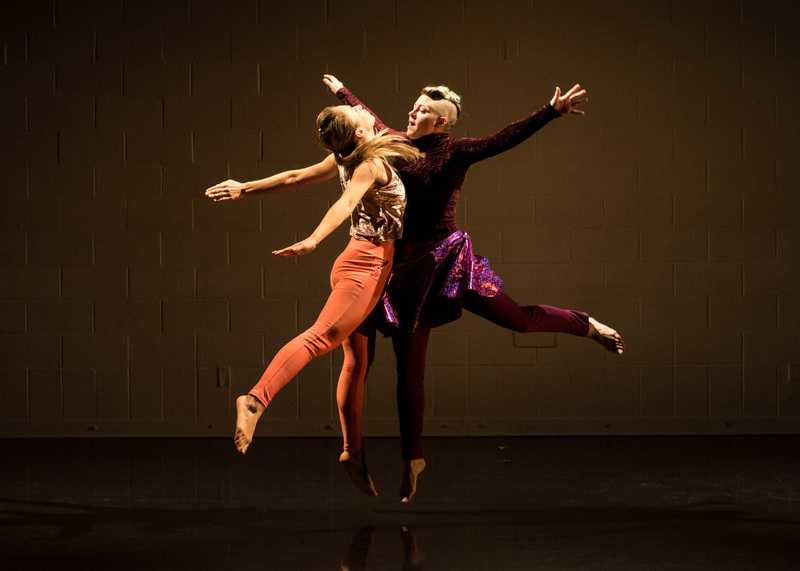 Participants investigate explosive potential of movement, tap their imagination through action based improvisations and transform everyday material into choreography. The focus is on energy flow, impulse driven functional motion, risk taking, contact, creative decision making, expressivity and artistry. Sandra Kramerová is Slovak born and Israel/New York crafted dancer and choreographer. She is immersed in practices of contemporary dance, physical theater, improvisation and somatics. 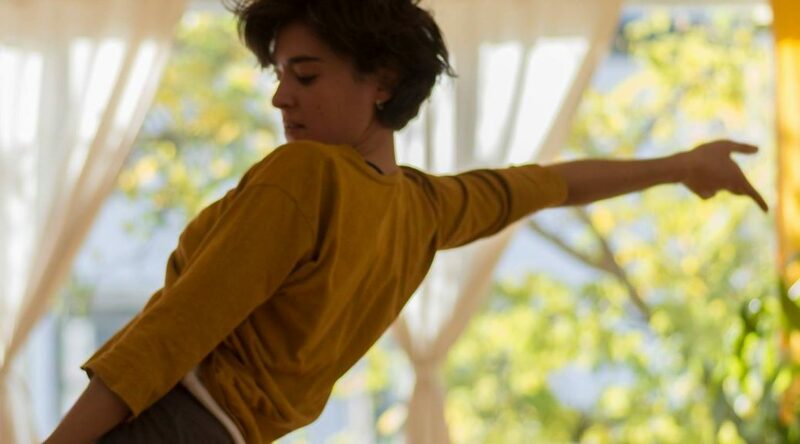 Before her Dance MFA studies in NY Sandra participated in Kibbutz Contemporary Dance Company’s International Program in Israel. Sandra performed and choreographed works presented internationally at BAM Fisher, Danspace Project, Dixon Place (NYC, USA), Zichri Theater (Israel) and at other venues in Slovakia and abroad. SPIRAAL is an original, contemporary approach to whirling movements. This approach was developped by Valentina Lacmanović, based on art, science research and practice. Spiralling movement is at the core of our galaxy, our DNA, it is the force of nature in hurricanes and vortices. Spiralling patterns can be found in the shape of our fingerprint and the form of Time. It is a powerful instrument that leads towards harmonizing our physical, mental, emotional and energy bodies. Valentina Lacmanović is a performance artist with background in acting (studied at CNSAD (French National Academy of Dramatic Arts) and dance (studied classical and contemporary techniques in Croatia, France, Spain, Turkey, India, and the Netherlands). She also possesses a Master degree in Philosophy (Université Paris VIII). Valentina was always attracted to a variety of cultures and has been introduced to Arab-Berber, North Indian music and dance, as well as practiced martial arts. She works and lives between Amsterdam and Paris. Her main focus is the creation of contemporary performances and video installations inspired by philosophical reflection on ritual practices and transformative performance acts. She continues her research (“From Trance to Performance”) on convergences and divergences between contemporary visions of performance and enacting of ancient rituals. Creativity workshop – How do I tell a story? What makes dance the unique form of art that it is and not just a series of movements? One thing more than anything else – telling a story. When we create, how do we tell this story through our dance? How do we tell it without using words? What character do I choose to be and how can a character help me tell my story? Or what happens when the character starts to tell a story of its own? “Dreams I have Dreamt in the Studio” is a solo piece, that tells something using different characters, different emotions. Learning some combintaions from the piece would be a place for us to start, and we will take it from there into trying different things that will help us find our creating characters, using movement, emotion, story and music. We will spend our time together trying to find our own voice within the creation and our creativity. Tal is an Israeli dancer currently based in Tel Aviv. She created and produced a project called “A Door to a Room” that brings dancers and musicians together. The project believes in taking the dance and the music into the world because everyone is entitled to it. Among other things, they created a show that explored the meaning of a place and how to create within it. Today Tal is working on a solo piece called “Dreams I have Dreamt in the Studio” to the music of Roee Ben Binyamin and Itay Ashkenazy. The piece explores the connection between women, music and nature. She also works on and a short duet called “Desert”. Tal will take part and present her work in Residencies in Dance City, Newcastle, UK (Creative Summer) and in CLOUD in The Hague, NL, this coming summer. Tal is also involved in building a new center for dancers at the Arab-Jewish community center in Jaffa. We are happy to announce the second European tour of Natsu Nakajima in Berlin, the Hague, and Barcelona. Natsu Nakajima (1943 Sakhalin, Japan) is one of the founding members of Butoh movement in Tokyo since the 1960s, and is one of its foremost pioneers abroad. Butoh-fu (Butoh Notation) from Hijikata’s work: how to use Butoh-fu and to combine with Hijikata’s method and Kazuo Ohno’s method. Natsu Nakajima (b. 1943 Sakhalin, Japan) has been one of the most prominent figures in Butoh dance since its foundation in Tokyo in the 1960s, and one of its foremost pioneers abroad. Training under both Hijikata Tatsumi and Kazuo Ohno, Nakajima went on to establish her own dance company, Muteki-sha, in 1969, with whom she has been performing and choreographing internationally since the early 1980s. Her highly acclaimed performance of ‘Niwa’ at LIFT ‘83 (London) marked the beginning of this international touring career, and led to performances at festivals such as FIND (Montreal), the Nancy Festival, and the Sydney Biennale. In addition to her performance and choreographic work, Nakajima has over thirty years of experience as a teacher, and has been one of the forerunners of dance for the disabled in Japan. Hijikata Tatsumi, who passed away in 1986, is the originator of Ankoku Butoh; and Ohno Kazuo (1906-2010), an extraordinary and rare dancer, was his great collaborator. Hijikata was like Picasso; every season, he would change the style of his works like a chameleon. This partly explains why each of his disciples developed very different working styles. Natsu Nakajima was among the founding members of the Ankoku Butoh movement and belongs to the first generation. Ankoku Butoh is a movement in the performing arts that was born riding on the wave of counter-culture in post-war Japan in 1950-1960s. 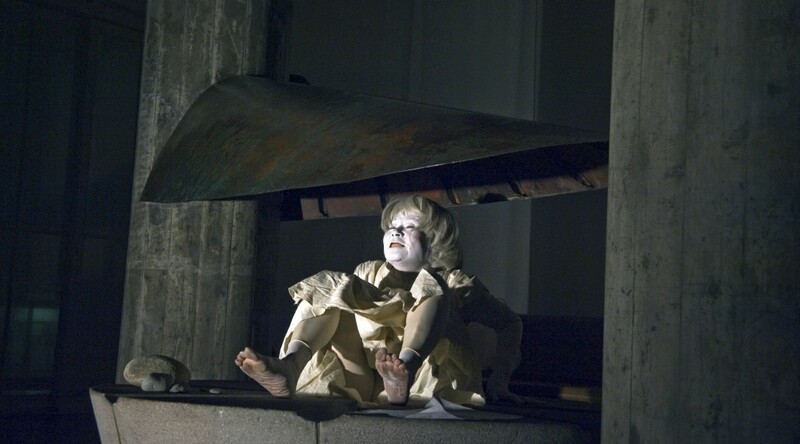 Now in Europe, and some other countries, the term “Ankoku” has been dropped from “Ankoku Butoh”, and the term “Butoh” has become more closely associated with these countries. 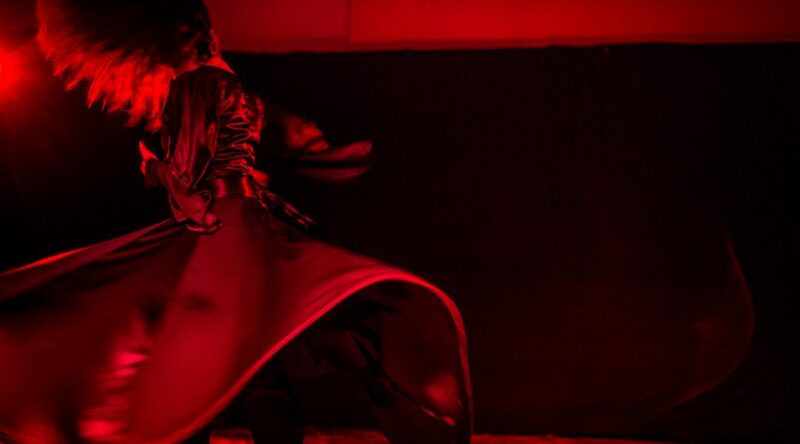 Losing “ankoku” has resulted in losing sight of the original ideology from when Ankoku Butoh was created and has given rise to many misunderstandings and misinterpretations. Whatever you may call it, darkness, spirituality, or even something formless, something that cannot be put into words, or simply, the unconscious, the inexplicable, the destroyed and disappeared… …we are actually talking about something that cannot be seen. Something that Hijikata called “ankoku”. Hijikata liked to use the word “yami” (shadowy darkness). It gives the feeling of something that is full of contradiction and irrationality, somewhere like the “chaos of eternal beginning”… To deconstruct Ankoku Butoh with “language” is moving further and further away from the joy of early Ankoku Butoh’s integral quest for “the body as the scene of fulfilled life”. Registration for 5-day Butoh workshop by Natsu Nakajima with an intensive training of 4 hours per day. The number of places is limited. Payment details will be provided and registration confirmed when payment received on CLOUD/Danslab bank account.